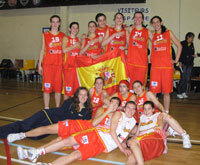 The Termosteps U16 European Championship Women 2007 final was between France and Spain wih France winning the game. With this victory France ended the Spanish hold on the Division A crown. The organisers of the tournament in Poinçonnet decided when fixing the schedule to put the match between France and Spain on the last day. They were rewarded with their foresight. Both teams had won their previous games setting up an unofficial final. France had beaten Hungary (74-56) with Adja Konteh and Jenny Fouasseau scoring 16 and 11 points respectively. France then went on to beat the Czech Republic (76-58) with Fouasseau and Konteh once again leading the scoring with 20 and 19 points each. In the meantime Spain beat the Czech Republic (85-55) with Yurena Díaz (1993 born) leading the way with 13 points and Anabel Toral contributing 12 points. All 12 players from Spain scored during the game. Spain were less generous against Hungary and won the match (92-39). Anabel Toral led the Spanish scoring with 15 points. On the last day in the final match France got off to a better start. They led (19-14) at the end of the first period. Spain were more disciplined in the second quarter and cut out some of the errors from the first quarter as they attempted to reduce their deficit. France went into the interval leading (37-35). Spain switched to a full court press and also managed to apply a solid zone and hit 5 straight points to go into the lead. By the end of the third period they had stretched their advantage to 7 points (59-52). The final period was classic end to end basketball in typical cadette fashion. Spain showed a lot of maturity in keeping France at bay and in negating the impact of Fouasseau and Konteh. So Spain went on to win (80-69). With Spain having won the match against the defending champions this preparation for the Fiba Europe U16 championship will give Spain a boost to get their title back this summer. Yurena Diaz who scored 18 points in the final match will be a young player to watch for the future. Other interesting players from Spain are Claudia Calvel and Laura Gil. For France it was also a good preparation. There were plenty of good performances with Konteh (left) scoring double digits in all the matches and leading the French scoring with 46 points. Fouasseau also had a impressive tournament offensively and scored in total 38 points. Héléna Akmouche and Eléonore Grossemy did their share of work offensively. Yet it was their synchronisation off the ball that was interesting to watch. Konteh won the award of MVP while the Hungarian team won the fair play award. Hungary finished third after beating the Czech Republic (64-49).